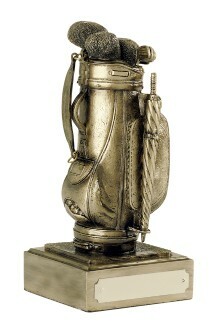 Here at Silvertrophy.com we are pleased to present this antique gold finish golf bag. The award is available in the following 3 sizes: 5″ , 6.25″ and 7.5″ . 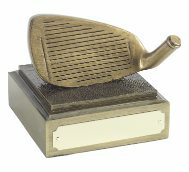 The award features a golf bag with a full set of golf clubs and an umbrella, mounted on a base complete with a gold engraving plate. The detail on this lovely Award is immense, with golf heads over the drivers, and a hanging bag clip. 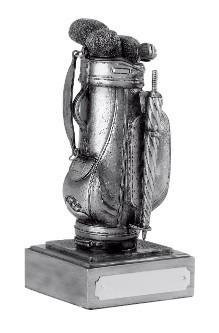 Modelled off a traditional golfers bag, this Award will not disappoint! Also supplied in an Antique Silver finish.